To escape the cold and long Canadian winter, we had spent about a week in Texas, and after enjoying pleasantly warm and sunny weather in late February it was time to head back to chilly Toronto. From San Antonio we had about a 26 hour drive ahead of us, so we left Texas early in the morning and starting driving through the flat landscapes of Texas, past Austin and Dallas, and all of Arkansas. After about a 10 hour drive, we were approaching Memphis, Tennessee. The sun was already standing low on the horizon as we crossed the Mississippi River on the iconic Memphis-Arkansas Memorial Bridge. 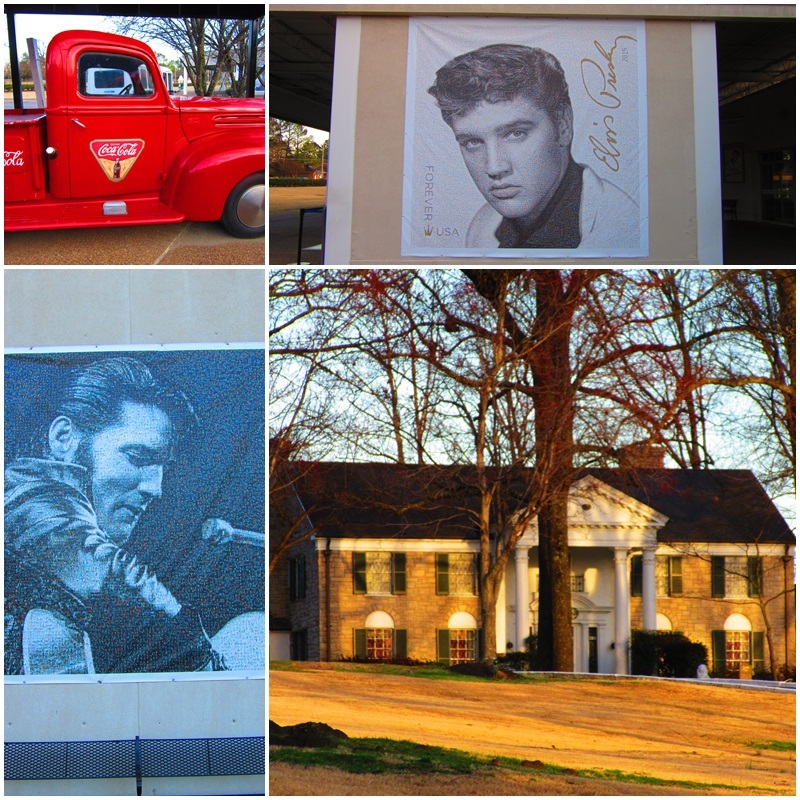 With our trusted GPS we made our way to Graceland, Memphis’ most famous landmark Graceland, the former home of Elvis Presley, “The King of Rock and Roll”, is by far the most well known and most visited tourist destination in Memphis. When we arrived in the late afternoon, the estate was already closed and tours had shut down for the day. We did manage to get into the gift shop just before closing, and picked up various memorabilia for my husband’s mother and brother, both die-hard Elvis fans. With that important visit completed we drove straight north on Highway 55 and exited to get on Riverside Drive. 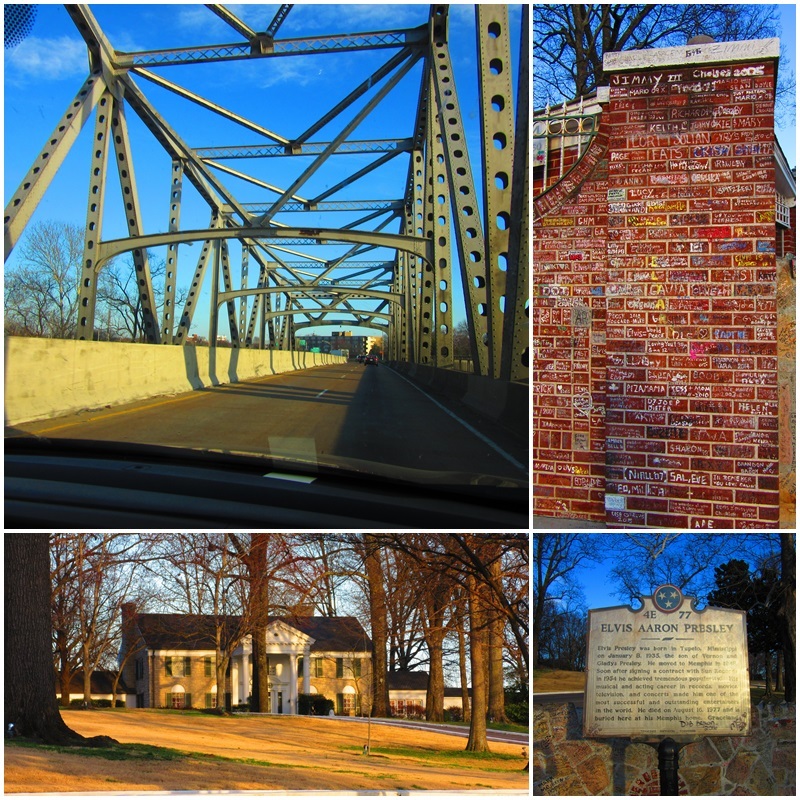 We parked the car and strolled to the elevated sections above the Highway from where we had an incredible view over the Mississippi River and the Ashburn Coppock Park. Dozens of people had gathered here in order to take in what was surely going to be an amazing sunset. 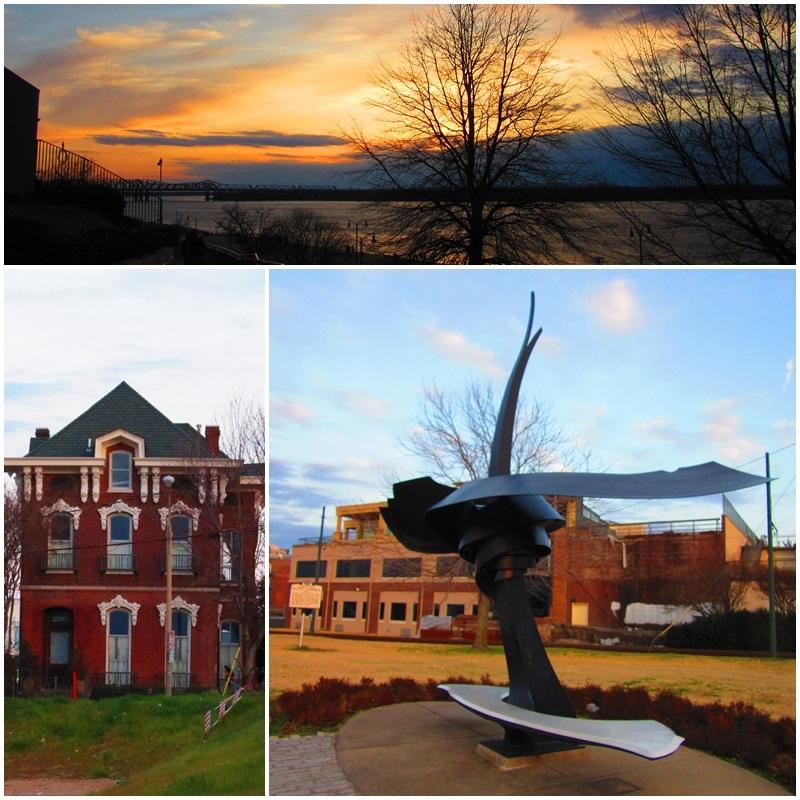 Memphis has an impressive riverfront along the United States’ largest river. The city is located on the Chickasaw Bluff, high ground that rises about 50 to 200 feet (20 to 60 metres) above the flood plain of the Mississippi River. 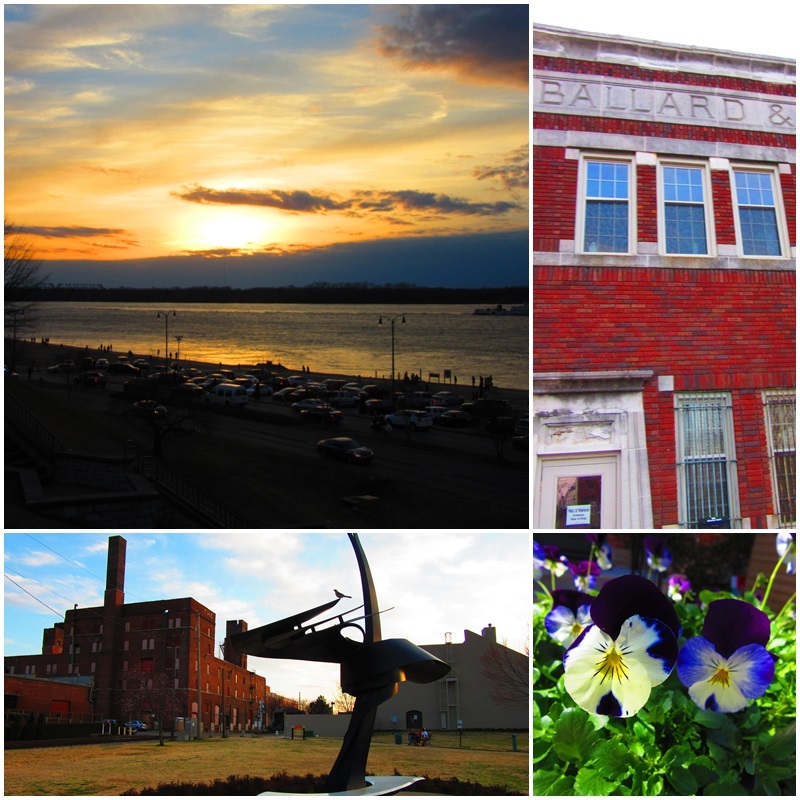 With a population of more than 650,000 people and 1.3 million in the surrounding metro area, Memphis is the largest city on the great Mississippi River and the third largest in the greater Southeastern United States. It was founded in 1819 by a group of wealthy entrepreneurs, including future US president Andrew Jackson. From Riverside Drive we drove downtown and checked into the Vista inn and Suites on Union Avenue. Naturally, my husband was tired from all the driving, so after a quick dinner I headed out by myself to explore downtown Memphis at night time. The city’s downtown core is home to the FedExForum, the city’s basketball arena; the Autozone Park, a Minor League Baseball Stadium; and the Peabody Hotel, a luxury hotel that dates back to 1925. The next places I wanted to check out were Main Street and Beale Street, Memphis’ famous entertainment street which was voted America’s Most Iconic Street by USA Today readers in 2013.